Lisa here, with an update on one of our favorite Tampa Florida Attractions. Zoofari is coming THIS WEEKEND! And to help get you all excited I am going to be doing a four blog series about this amazing event. This blog is going to be all about tickets! Currently the Zoo is selling tickets for $75 online, or $80 over the phone. This is a LIMITED time offer! On FRIDAY tickets will be $85 and only available at the door. If you do purchase tickets in advance, please be sure to bring your receipt the night of the event. I guess I should tell you when it is! 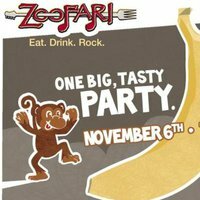 Zoofari is THIS SATURDAY NIGHT (November 6th) at 7pm! The basic ticket includes all you can eat and drink! Of course if that isn&apos;t enough, and you want to be treated like a Rhino, that is also an option. You probably think being a Rhino is a bad thing, in this case it&apos;s not. If you upgrade your ticket, you get early entrance at 6 (instead of 7), early access to food, preferred parking, Hors d&apos;oevres, smaller lines for Rhino Club-member only restrooms and bars (I would say the upgrade is worth it for these two alone), and program and banner recognition. The cost is $135 for an individual ticket. I forgot to mention that you also get to use the beautiful Safari Lodge! There are also different sponsorship options available. All of them include everything the regular Rhino Club ticket includes, they just give you a bigger price break. There&apos;s the Corporate Package with 10 tickets ($1,150), the Bronze Package with 20 tickets ($2,025), the Silver Package with 30 tickets ($2,835), the Gold Package with 40 tickets ($3240), and the Platinum Package with 50 tickets ($3,375). Each level offers a bigger discount, plus the VIP amenities. The highest level being the best bang for your buck! So gather your friends Tampa, and come enjoy some fine Tampa Bay Dining at the Lowry Park Zoo! And check back tomorrow for part 2 of the Zoofari Blog series!